This months’s Marie Claire had a piece about nail art that you can do yourself at home called, “Hands on.” I decided to give the look by Jessica Washick a go. I thought I was painting something totally different than last week’s look, but it ended up looking similar in the end. 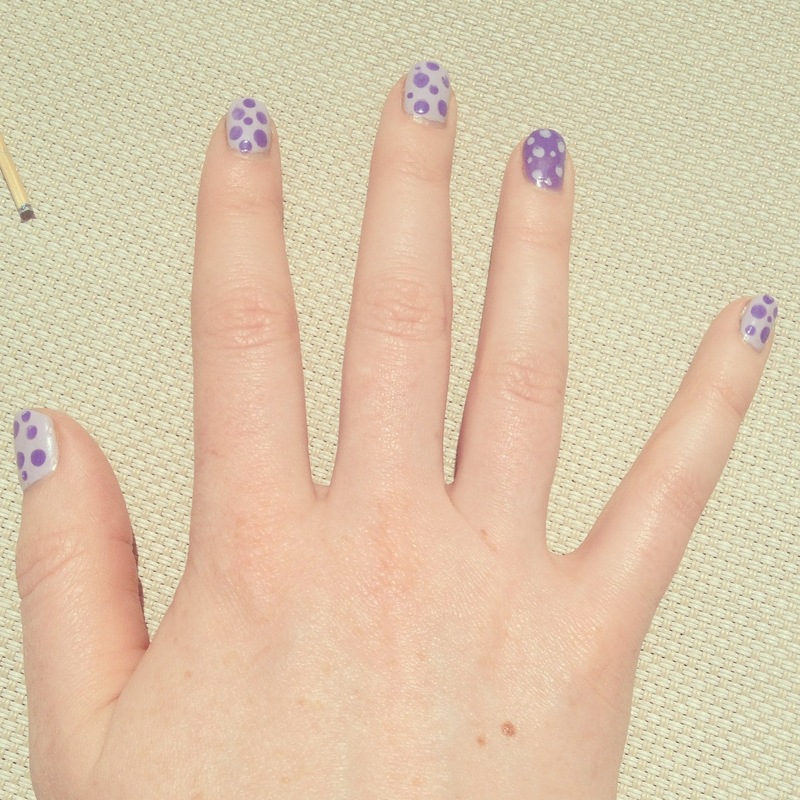 At least the nails look a bit more like a spotted animal print than polka dots. Next week, I’m really going to try something completely different! I skipped the brush and painted the spots freehand with the brush included with the polish for even more savings. 2) Seeing the Marie Claire article showed me a new way to use what I already had, which is what fashion on a budget is all about. 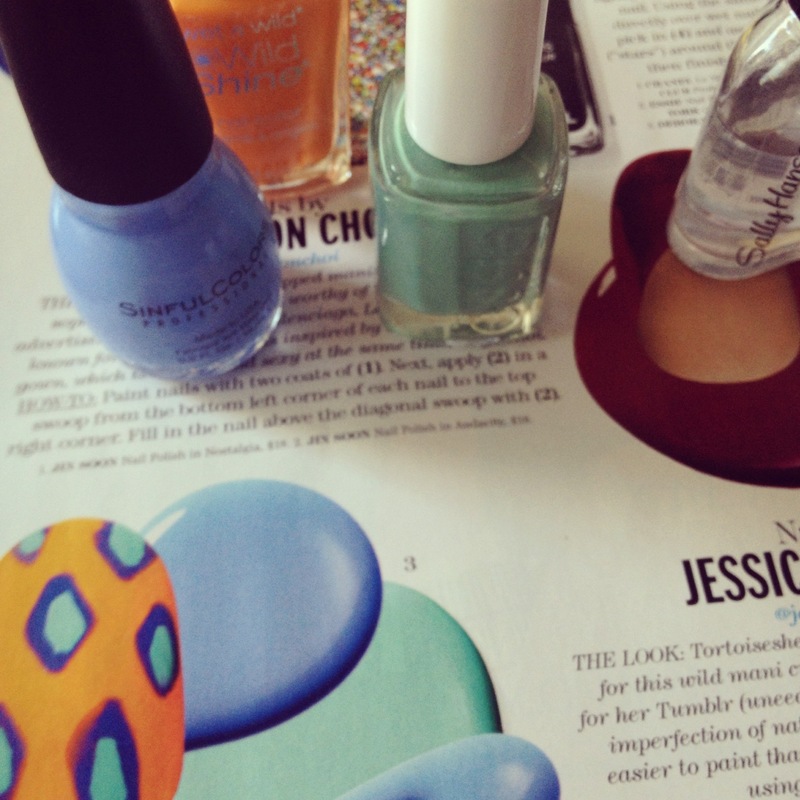 There are so many great nail blogs, Pinterest pins and magazine articles dedicated to painting trendy nails on your own. Check ’em out for your own inspiration! 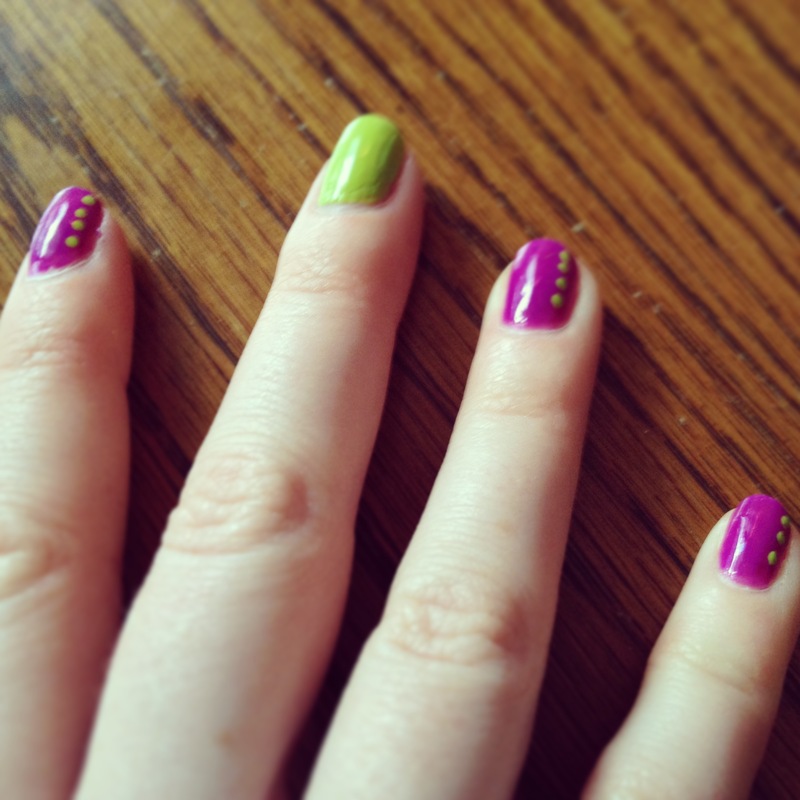 Painting your own nails is an easy way to save money, while still keeping a polished (pun intended) look. 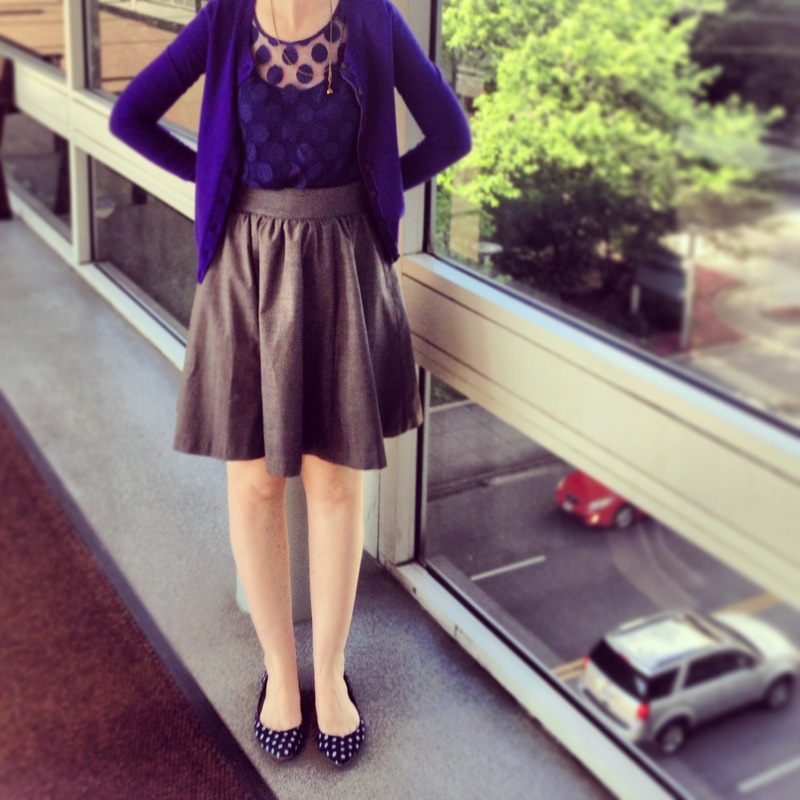 In keeping with my dress and skirt theme this month, I kept my Friday look simple with blue and purple polka dots! 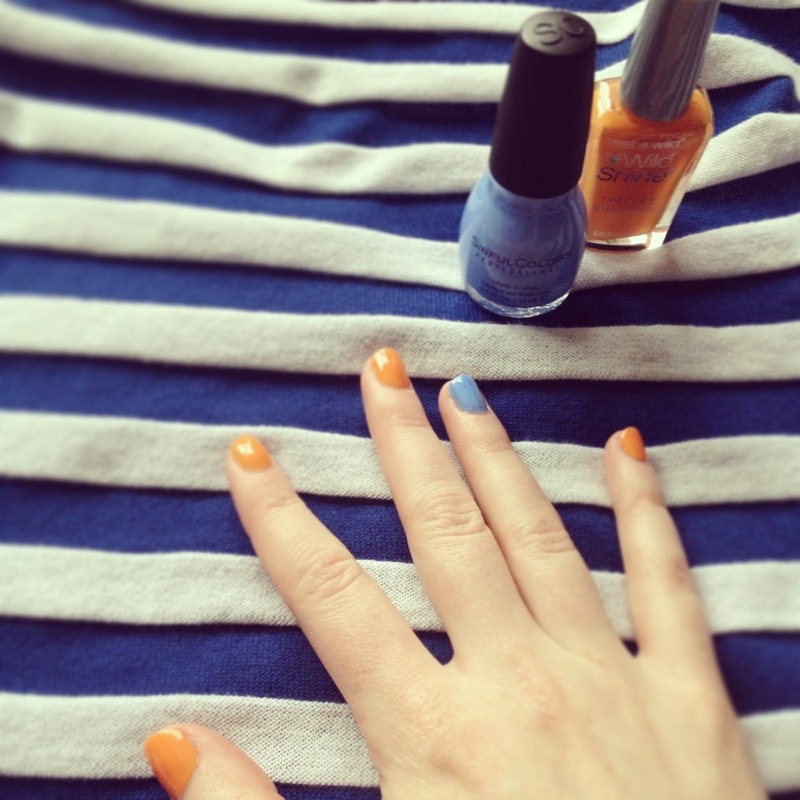 My nails ended up matching another outfit this week. 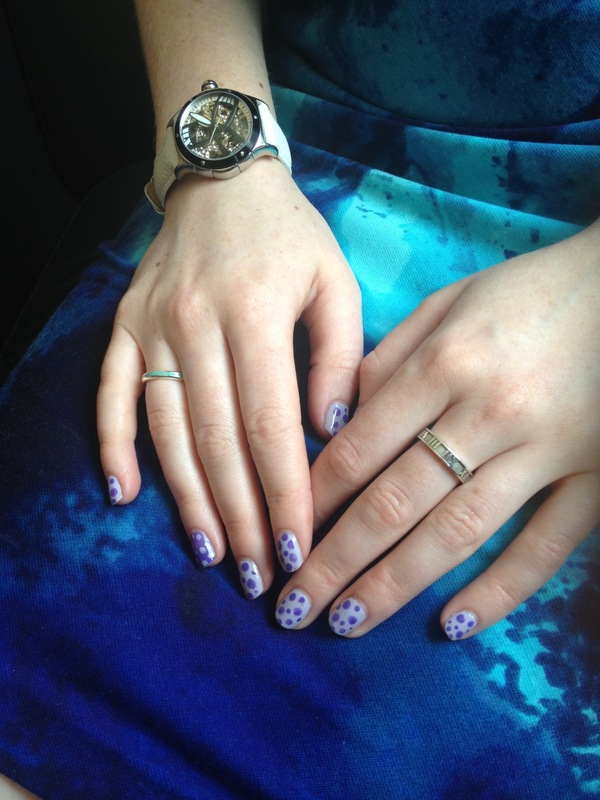 The purple polka dots were much more versatile than I anticipated! 1) Even though my top and shoes were from two different stores, they ended up matching perfectly. If you are looking to match pieces from different stores, you can always carry pieces you want to match in your purse. 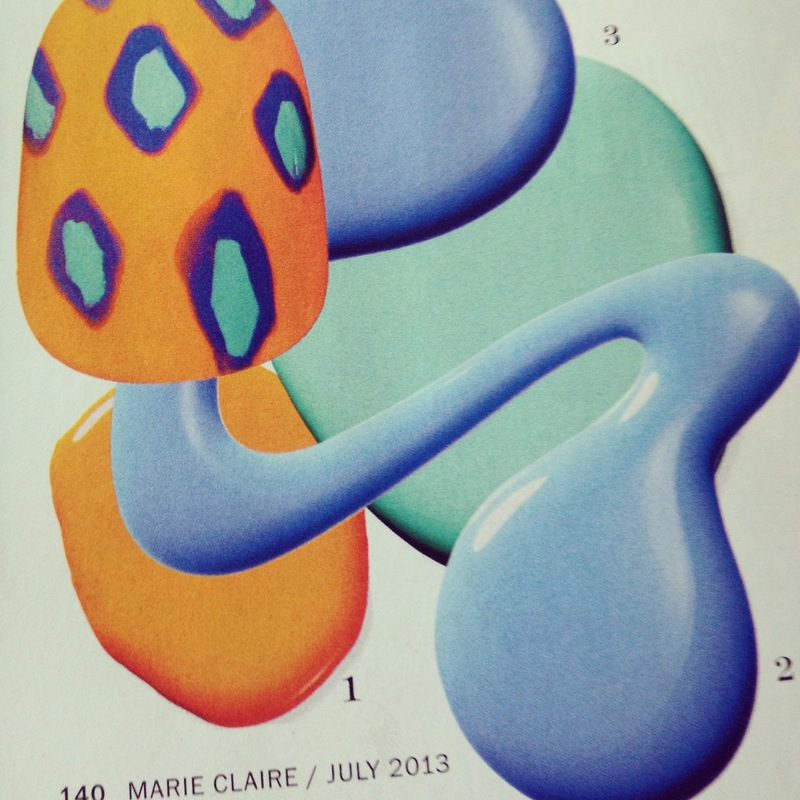 In the past, when I have carried around a photo of the piece I’m trying to match, the colors did not end up matching quite right. So, it is generally best to carry the actual piece, if possible. The benefit of shopping this way is you may find better deals at different stores, versus shopping solely in one store. 2) The blue top is a great sheer piece with a tank top already attached to it. You guys know how I feel about sheer at work! You can do it, just add a top underneath (if there is not one already attached) and a cardigan. You’ll be good to go! Happy Sunday, readers! Hope you enjoy the rest of your weekend! 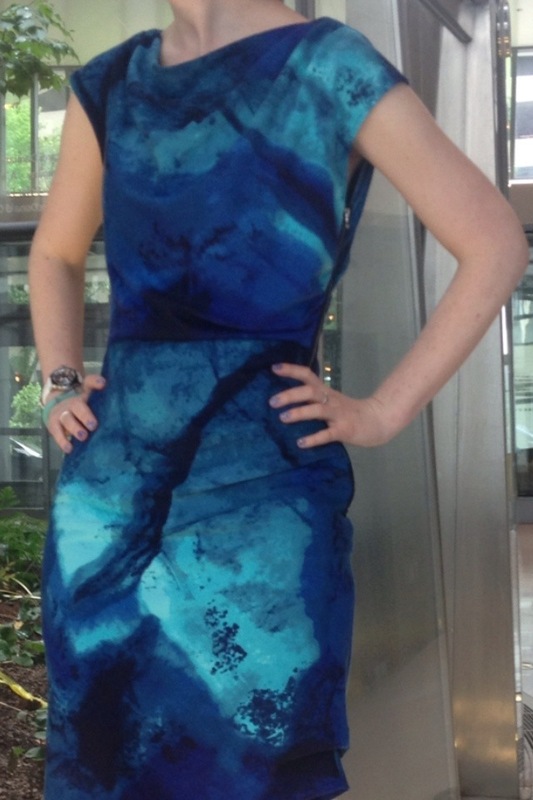 I think it is safe to say that I have been on a serious dress kick this summer. 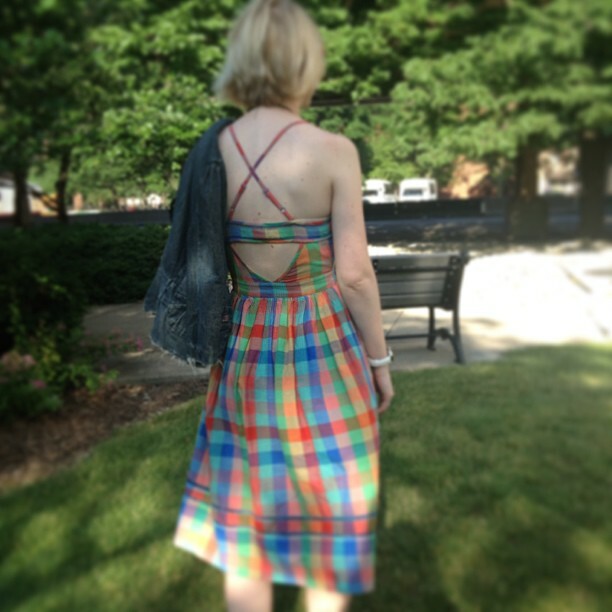 This plaid dress is no exception to my summer favorites! When I found this rainbow dress at Urban Outfitters, it immediately caused me to think of Little House on the Prairie. I don’t know if it’s the plaid, the length of the dress, or the cut, but it seems like a prairie dress to me! Living in the Great Plains, I think it is the perfect homage to Midwest history! The dress has great back details with a cut-out and cross straps. 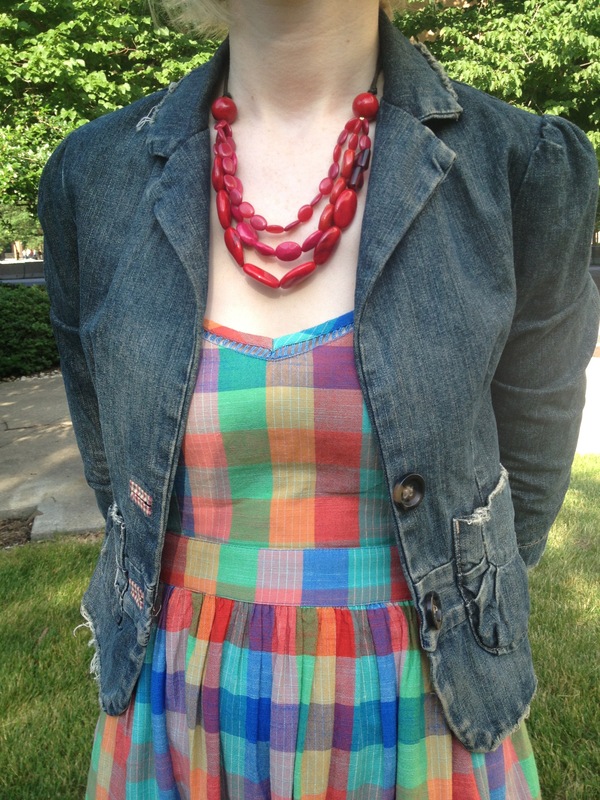 To keep the dress work appropriate, I added a denim blazer, a red beaded necklace and gold wedges. 1) While the Bitten line by Sarah Jessica Parker no longer exists due to the closing of Steve and Barry’s, the tagline still remains in my heart! She spoke widely about the clothing line, touting the tagline that “fashion is not a luxury.” I have always agreed with this sentiment and hope that my blog speaks to the fact that fashion can be affordable and accessible. Lower price point clothing can translate to high quality. Many designers now have lines at chain stores, making high quality and fashion-forward clothing accessible and affordable. Side note: The New York Times wrote an interesting piece about SJP wearing a Bitten dress that she designed to an awards show. It was perhaps the cheapest dress ever worn to an awards show at a price of $8.98. You go, girl. It is another rainy week here! 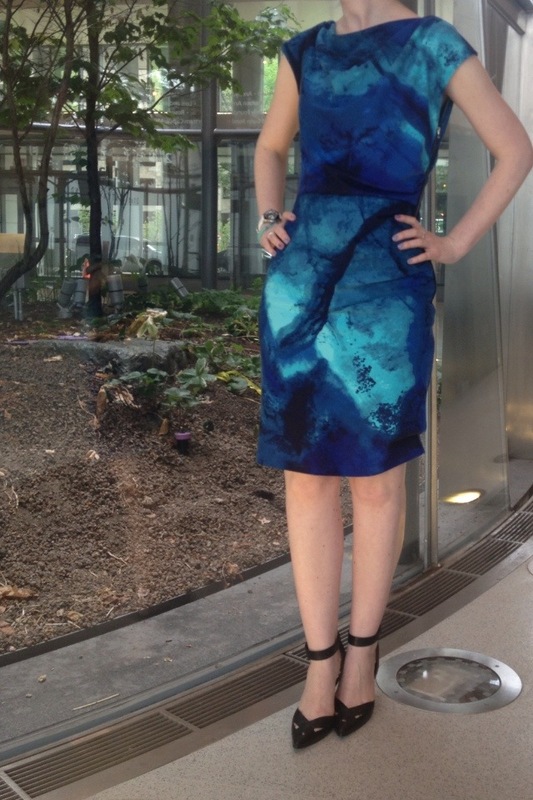 I took note of the weather and wore one of my favorite dresses by Donna Morgan. The is a beautiful water-like/watercolor printed fabric, which I immediately loved when I saw it. The dress has some nice structural details with the bold side zipper and the draped neckline. 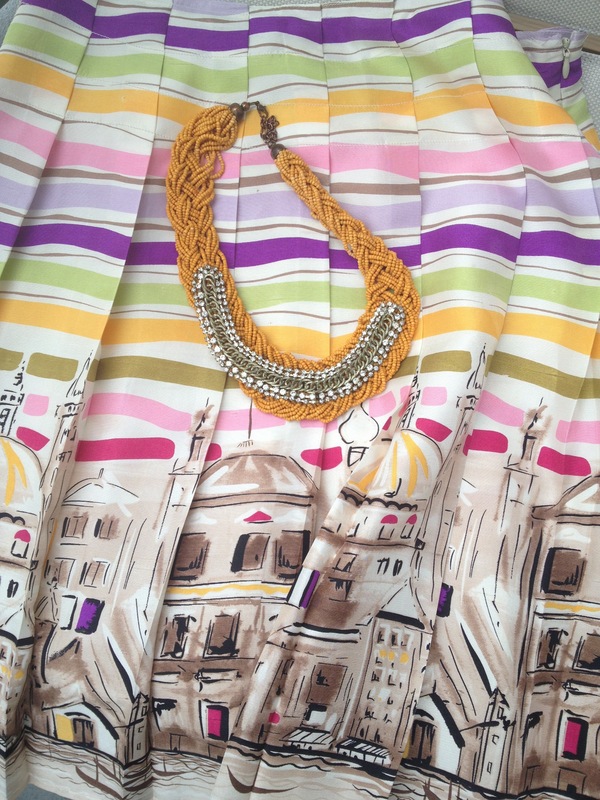 Because this dress has a lot going on with the print and cut, I kept my accessories simple. 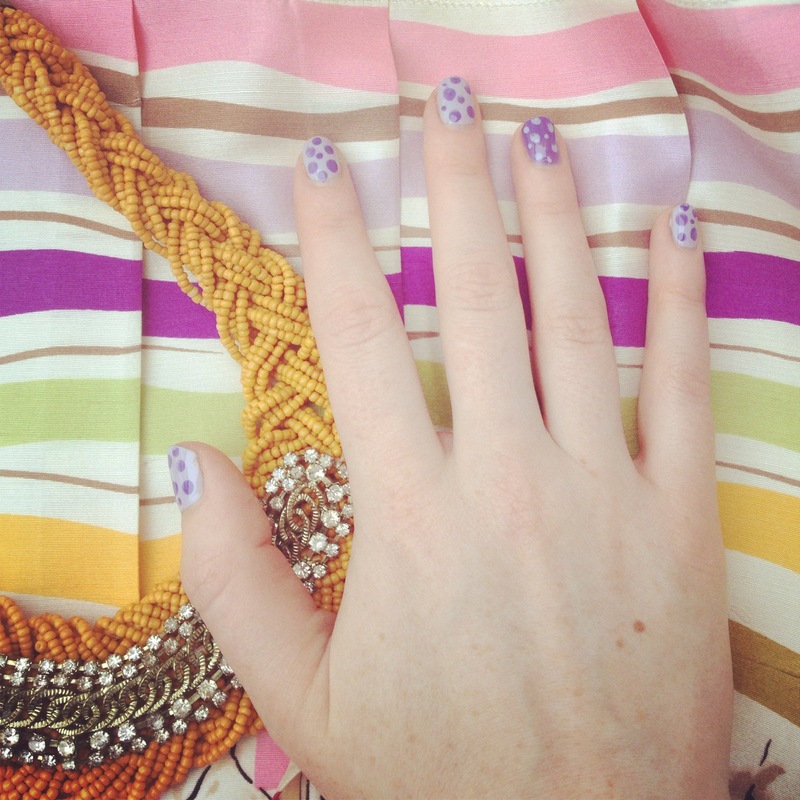 Somehow, even the purple nails seem to look okay with this dress! I added the heels I wore earlier this week to complete the look. 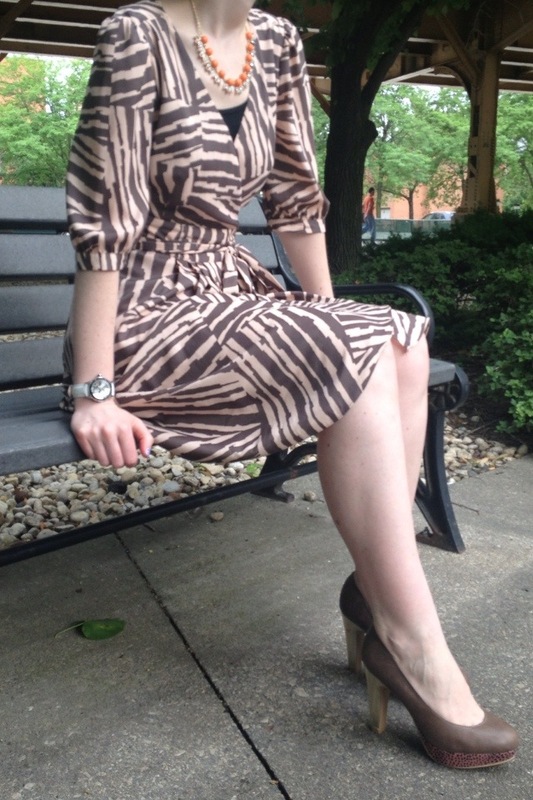 1) I am a big fan of the Nordstrom Rack clearance dress section, as I have mentioned in the past. When you go in the store, there are always regular dress racks. However, when you look around (often in the back), there should be a section labelled “clearance.” You’ll know you’re in the right place when you see red stickers on the price tags. 2) Nordstrom Rack is having their semi-annual “Clear the Rack” sale starting next week! The sale runs July 2-July 8. Items that are part of this sale are up to 75% off. This is a great time to check out their clearance section- especially the shoe section! 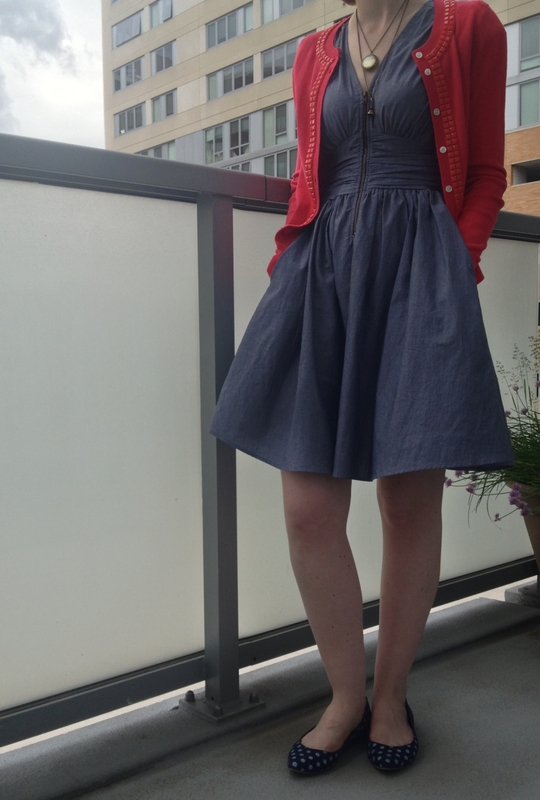 Despite the rainy day, I put on one of my favorite wrap dresses this morning! Admittedly, I did wear my rain boots during my commute to work. 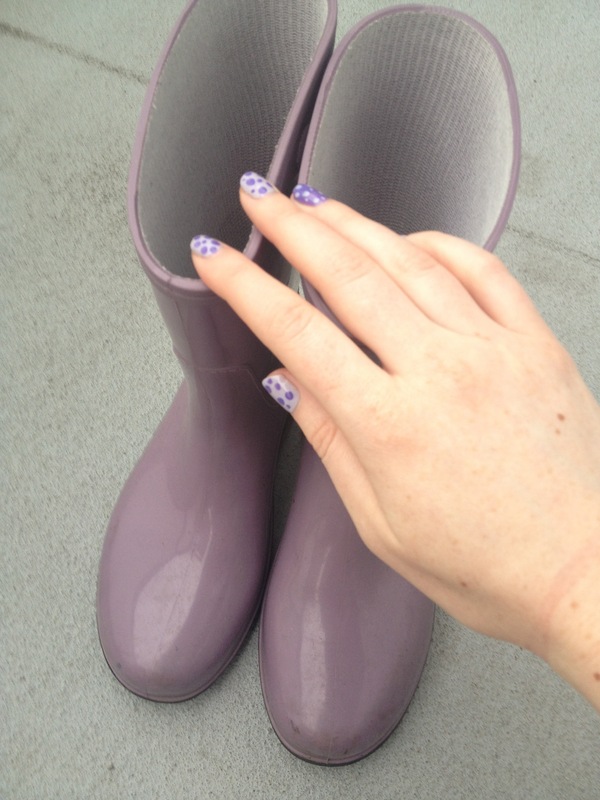 My rain boots ended up matching my nails- always a bonus! I switched to my platform heels once I got to work. Savvy commuting is definitely fashionable! I added my pumps and Charming Charlie find to complete the look. This dress is definitely a few years old, but I keep it looking fresh by changing out my accessories. 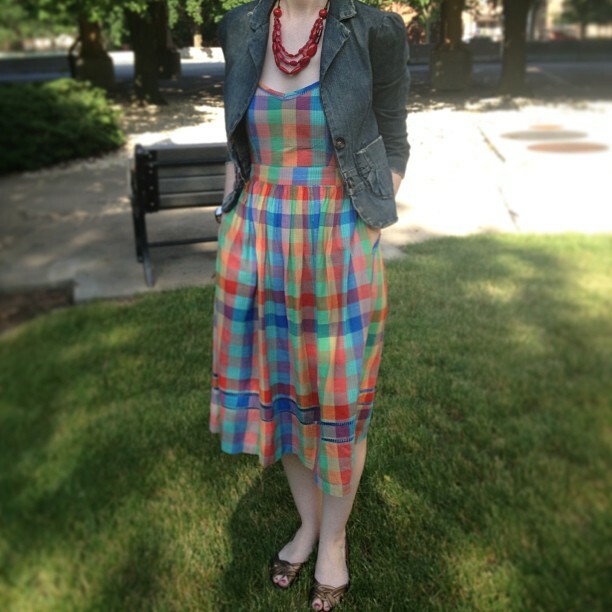 1) Some styles are classics; I include wrap dresses in the “classics” category of my wardrobe. 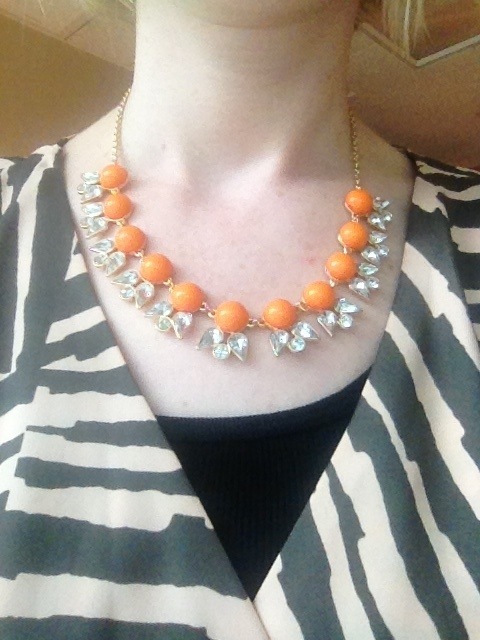 Even though this dress is a few years old, I added a trendy necklace to keep it looking brand new. You can rotate your classic pieces for as long as you want. Update the piece by changing out your shoes and accessories. I cannot say it enough: fashion on a budget is all about rotation! 2) Most wrap dresses, like chiffon or sheer pieces, require a slip underneath. Transition wrap dresses from day to night by ditching the tank top or camisole underneath, if you want. When at work, however, keep it classy and not low cut. Appropriate coverage is always in style! Happy Monday, readers! 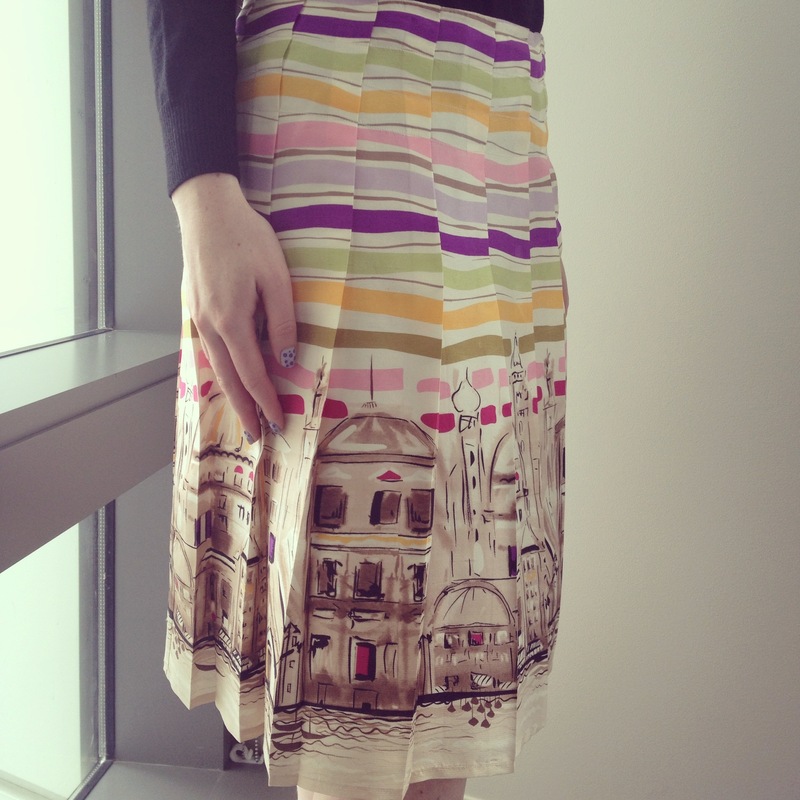 I love prints (as you may have guessed), and this skirt I found is no exception! 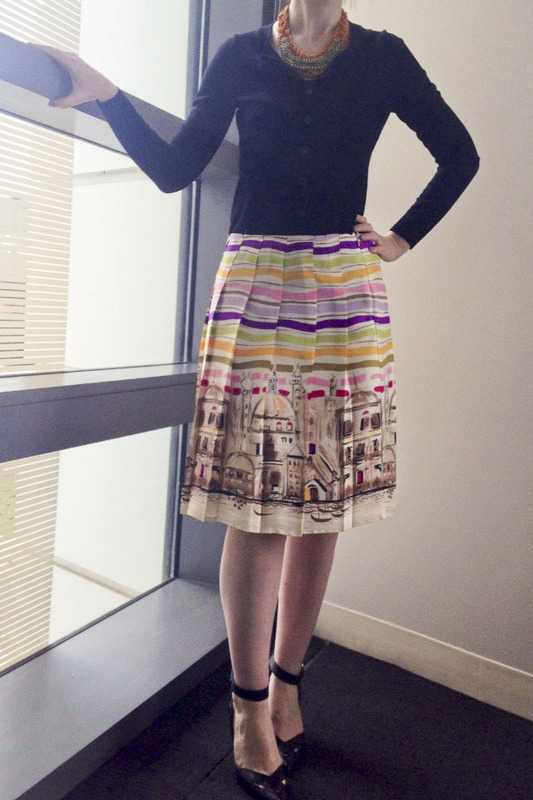 Even though I’m not currently on vacation, this silk skirt reminds me of being on vacation! A close second! 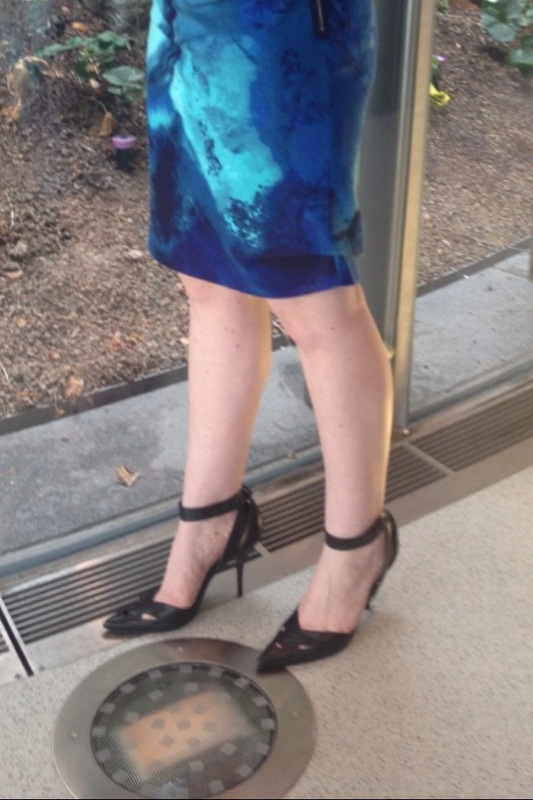 I wore ankle strap heels and one of my Charming Charlie necklaces to complete the look (sorry for the dark photo!). 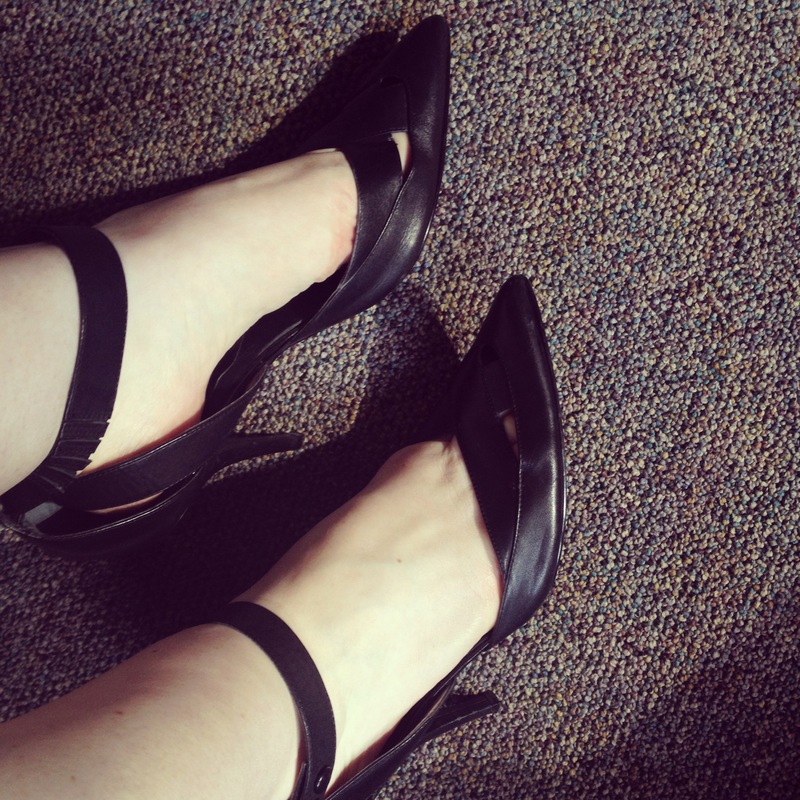 These ankle strap heels were a real find at $6! I found them at my favorite consignment shop…another find that looked as though they had never been worn. They are surprisingly very comfortable! 1) This skirt is very busy with the stripes and print. I looked for tops that would match, but ultimately settled on a black cardigan tucked into the skirt. 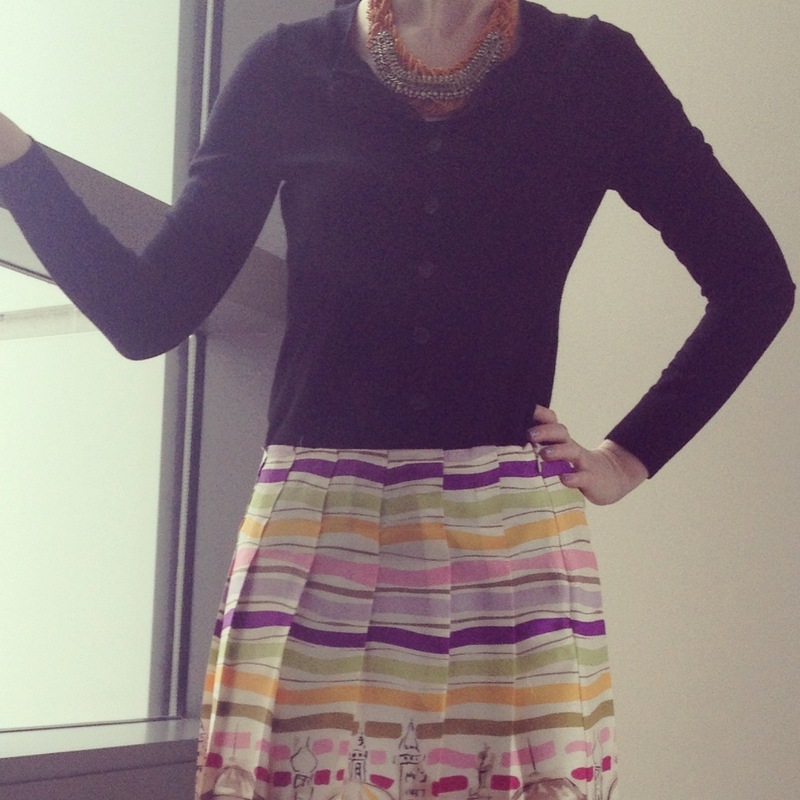 When I added a bold necklace that matched the skirt, the outfit still looked coherent but not overly busy. And, joy of joys!, my nails ended up matching perfectly. 2) One of my favorite tricks at stores is to look through all of the racks, including the sizes that do not generally fit me. First, every manufacturer/designer has their own sizes, so you never really know what “true size” you are. Second, sometimes pieces wind up in the wrong section. I found this skirt in a different size section than where it belonged. I’m guessing people saw that and looked past it. It pays to go through all of the racks, you guys! Have a good week, readers! Thank you for all your support in my fashion hunting adventures! 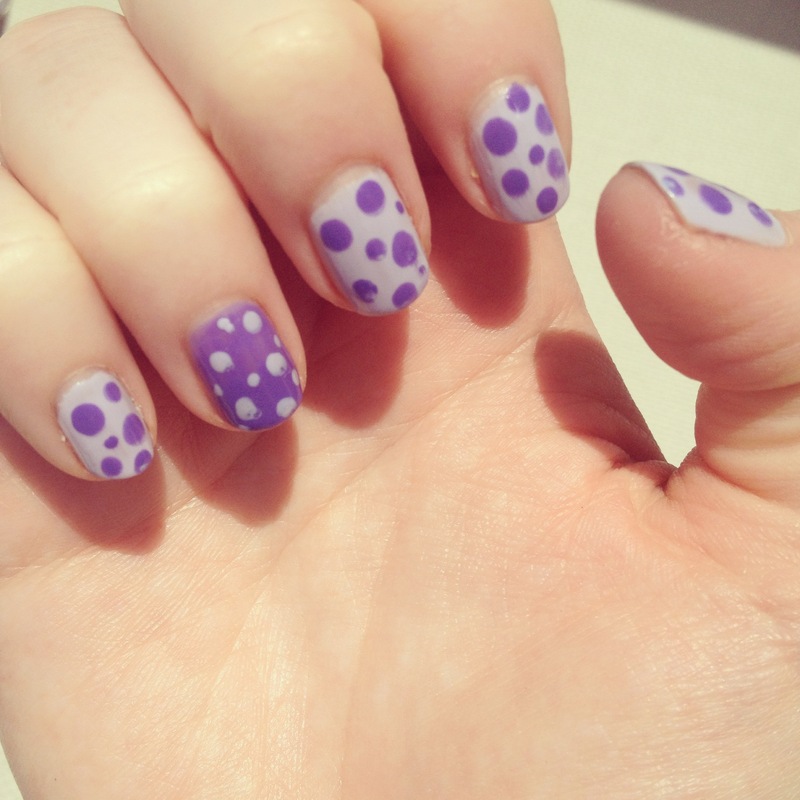 purple pastel polka dot polish! 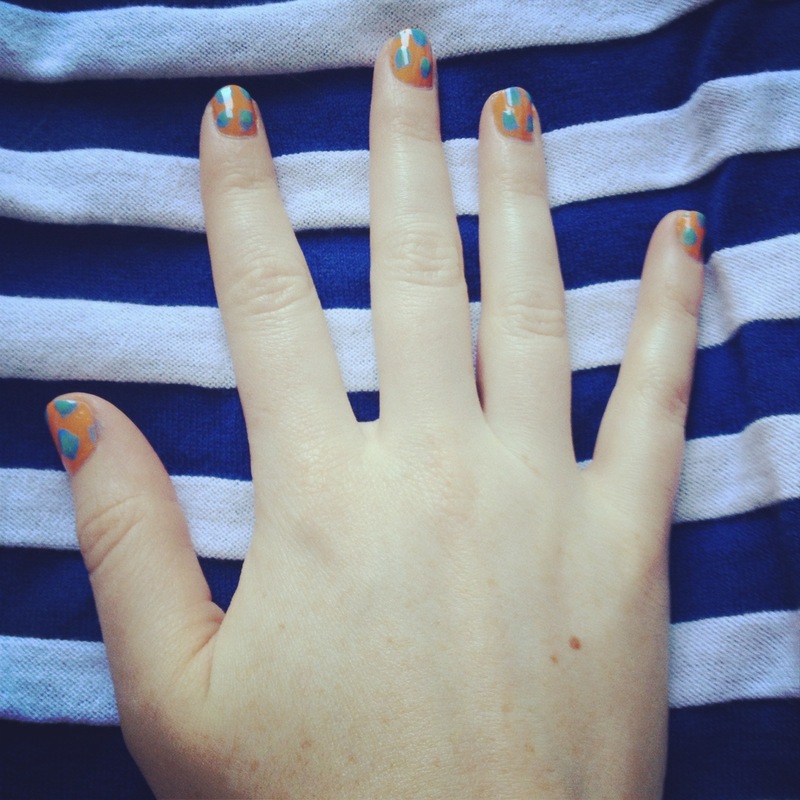 Let’s face it: I have become addicted to nail art. Admittedly, I am still working up to more involved nail art. For now, I am sticking with easy-to-paint polka dots. Maybe in the next few weeks, I’ll try something else! 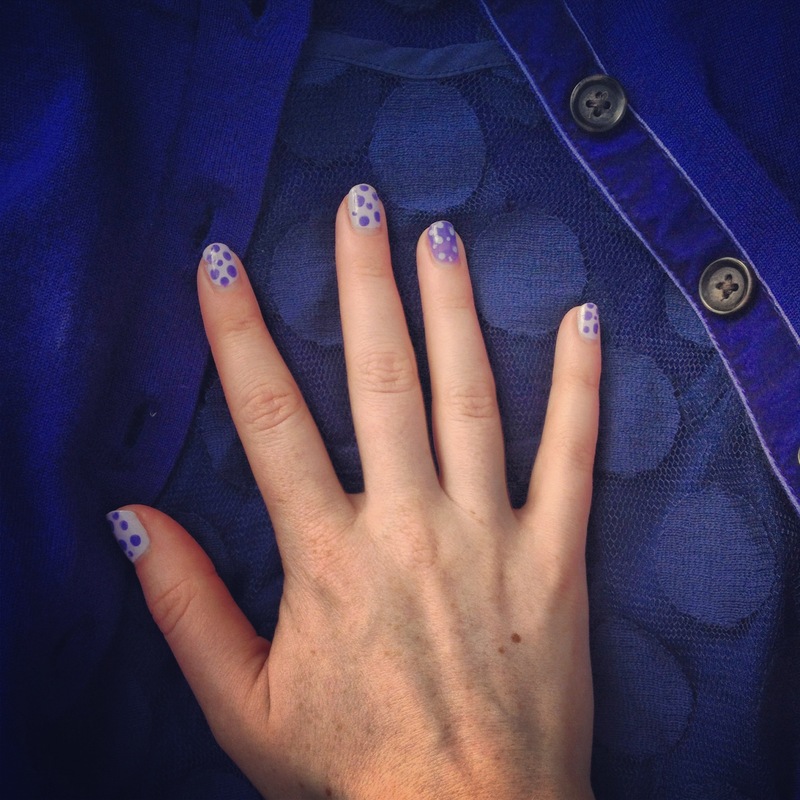 I found a skirt recently with purple details, so I took a cue from the skirt for this week’s nails. 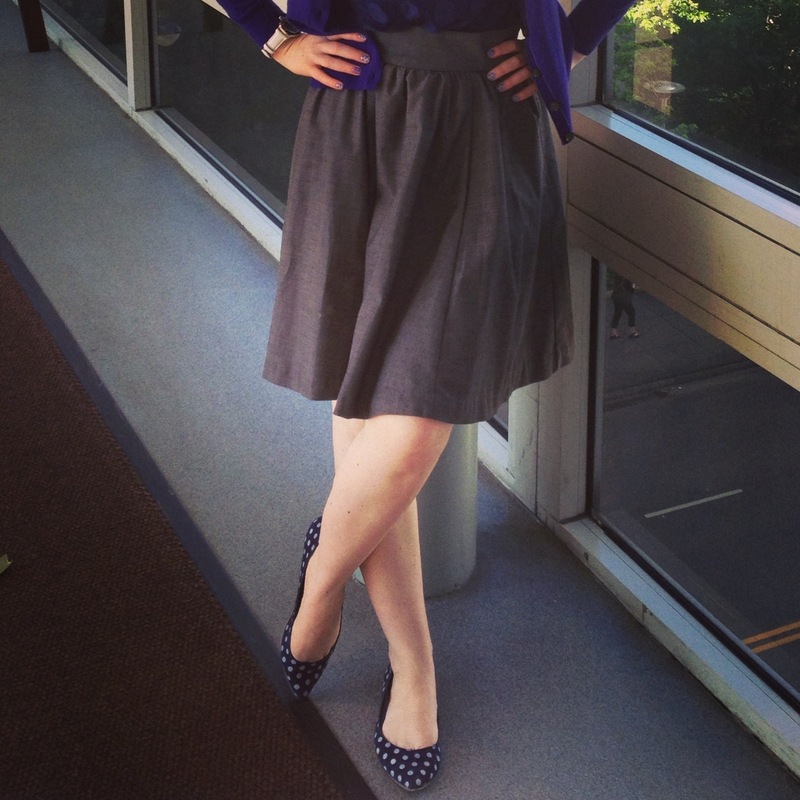 Check out Monday’s post for more on the skirt! 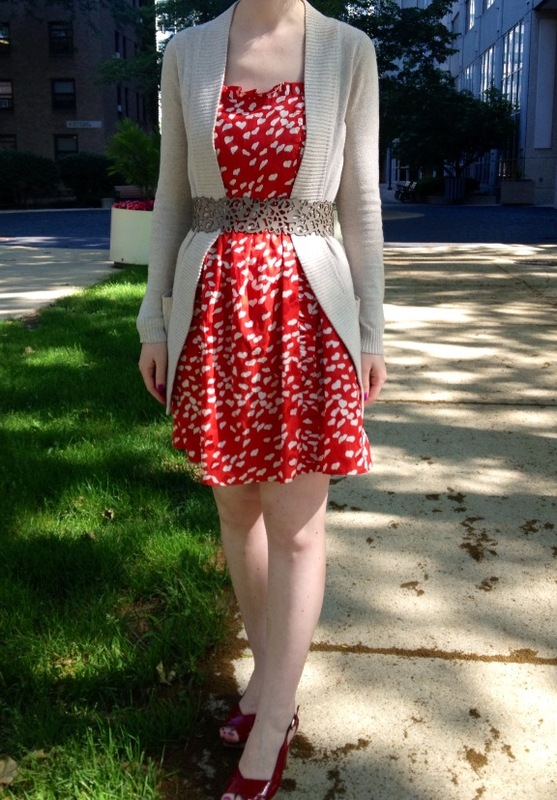 This week’s polka dot look seems a little spring-like to me, but I decided to keep it anyway. 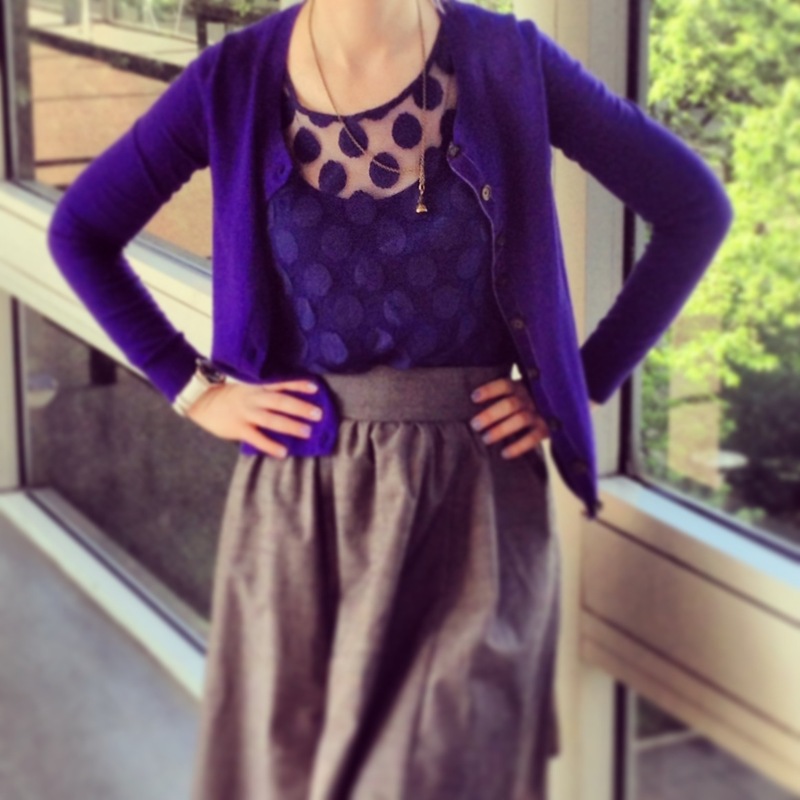 1) It is pretty safe to say this look may not match a lot of what I am going to wear this week, but who knows? Maybe it will! If not, I still like it! Often, when I am pairing things together for the first time, or out shopping, I think “this might be weird-looking…” but I always end up liking it. Fashion is a form of self expression and having fun! 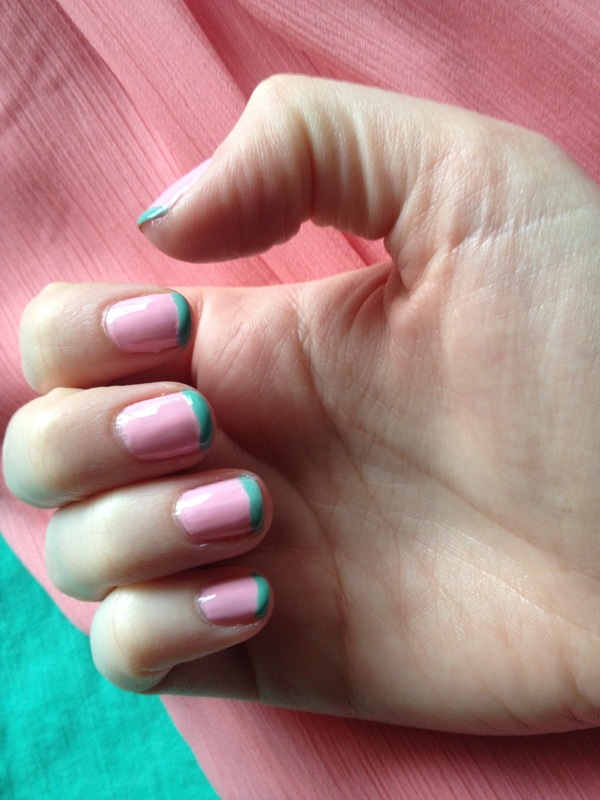 An easy way to start trying new things is on your nails. If you do not end up liking your look, just start over! I often hear people say, “I could never wear that,” or “I could never try that.” Why not?! Have fun and give it a try! 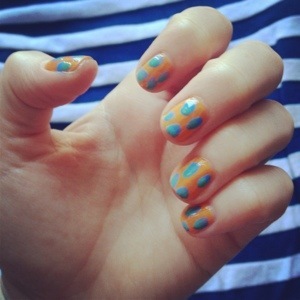 2) Polka dots have been the easiest way for me to try nail art because I have been using a toothpick or a wooden skewer to make the dots. The toothpick/skewer makes it especially easy to paint when you are using your non-dominant hand! 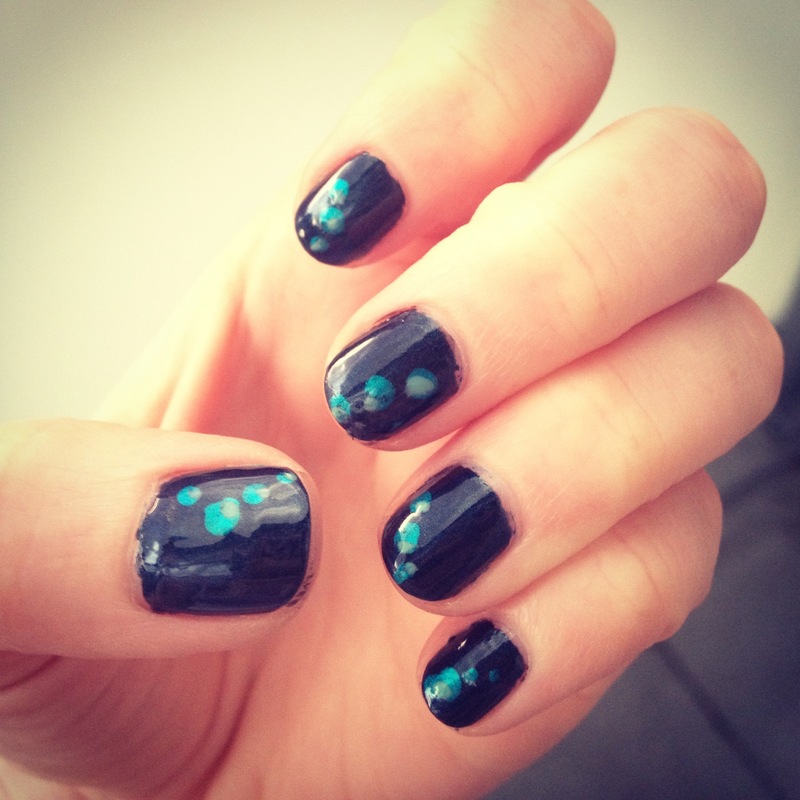 There are so many great nail blogs out there for inspiration. Check out the blogs I follow for inspiration of your own. Happy Sunday, readers! Thanks for visiting!